In 1966 the small Western Sicilian city of Gibellina wasdevastated by one of the earthquakes that frequently strike Southern Italy.The city was eventually rebuilt on a new site twenty kilometres away leaving the abandoned remains of old Gibellina to the harsh climate of the arid Sicilian Desert. In 1982 the "Association Teatro di Gibellina" was formed to mount avant-garde productions in the space that was formerly occupied by the old city. 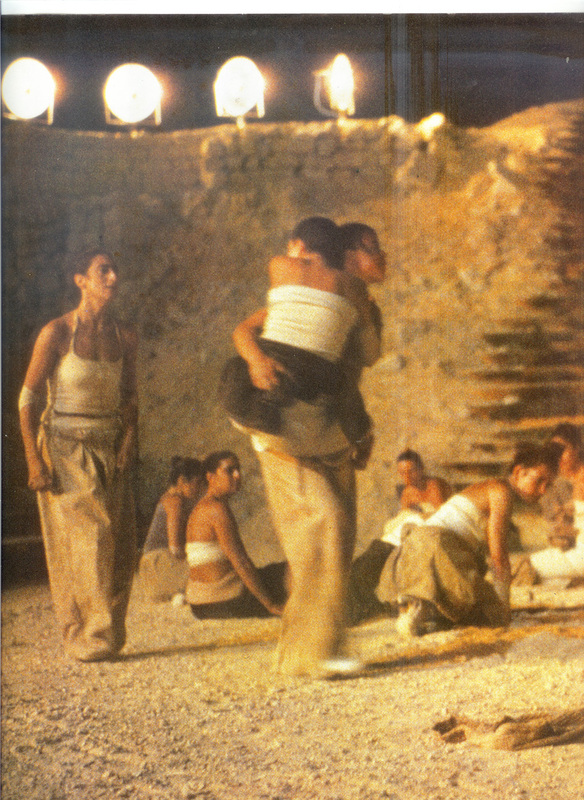 In September, 1988 the "Association Teatro di Gibellina" hosted on extraordinary theatrical event - a production of Euripide's Trojan Women directed by the Belgian Thierry Salmon, one of the most exciting young directors working in Europe today. Salmon works primarily in Italy and is noted for his challenging choice of repertory and his inventive use of unconventional spaces. 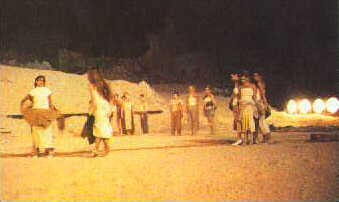 The play was performed using the original Greek text by a multinational company of 36 actresses in the huge area that was formerly the main square of Old Gibellina. One of the most fascinating aspects of the production was the use of gas lighting as the stage lighting. Thierry Salmon assembled a design team which consisted of Nunzio - the production scene designer - in reality a sculptor who had won the Venice Biennale in 1986, Italian costume designer Tobia Ercolino and Florentine lighting designer Enrico Bagnoli, one of Salmon 's most frequent collaborators. Wood, earth and iron were the principle elements of the set decoration. Fire has a symbolic and evocative force. We believe that the flame unites two elements - primitive fascination and immediate energy. We were attracted by the civilised aspect of the fire, ifs everyday use. Because of this double meaning we used two kinds of gas lighting - an actual fixture which transformed the flame into a focusable beam of Light through an optical system and an open flame device. The gas lighting fixture was a testimony to human intervention and the open flame device represented primitive force The 25 gas lighting fixtures were mounted in banks over the perimeter of the circle. The technicians constructed a console with the capabilities of control normally associated with conventional lighting consoles. Through five « controllers » at the console an electrician could regulate the pressure of the combustible propane gas that feed the fixtures. Each controller corresponded to a bank of fixtures. Only one gas tank was used to feed all 25 fixtures. Although a total «black out was impossible. a valve placed in the main feeder circuit allowed an electrician to suddenly decrease the pressure of the gas giving the feeling of a rapid black out. The console permitted me to execute dissolves, cross-fades and subtle intensity changes. Each of the feeder circuits was equipped with a pressure meter as a reference so that the intensity of the projectors could be recorded NI the lighting script and duplicated, during the performance. Paticular attention, was given to the form of the projector, a large mirrored parabola 70 cm. in diameter that gathered the light into one point over much like the famous mirrors of Archimedes. Mounted over the perimeter of the acting area, including the audience. they helped suggest the feeling of a concentration camp, a valley almost totally surrounded. 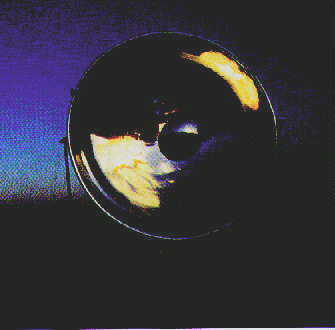 The effect of the gas lighting fixture, was enormously powerful because the light itself has its own movement and noise. The wind made the flame move, and the actually movement produced a noise that the audience could hear. The projectors were focusable from spot to flood. They produced a yellow beam of light which reflected the warmth of the sand back to the audience and made the actresses seem «ghosts » lit by a dense pallor. The difference between gas lighting and conventional lighting is like the difference between sitting in front of a fireplace and a radiator. Both radiate heat but the fire provides the tactile sensation of movement and sound.